Living in Yakima in the 1950’s and 60’s, while under the age of twenty, I loved seeing photos of cool young people wearing berets. Especially if they matched them with a black or striped pullover top. I actually had a tiger-striped beret and cool hexagonal sunglasses with rose-colored lenses when I was fourteen; but my grandpa, who could be mean, saw me dressed up like that, and he made fun of me. So I quit wearing that gear. Later, I got into the hippie thing, and after that, the cosmic cowboy thing, and I forgot all about beat fashion. 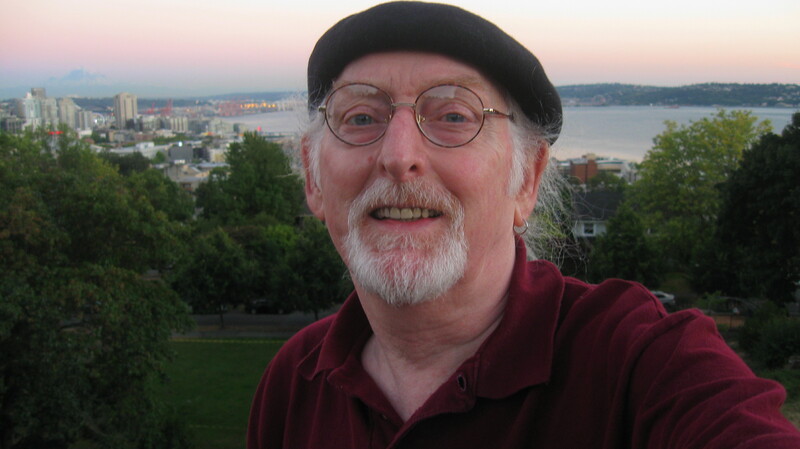 In 1981, having relocated to the other (green, moist) side of the Cascade Mountains, and having achieved thirty years of age, I moved to a rather beat/boho Seattle neighborhood: Capitol Hill’s 15th Avenue East. 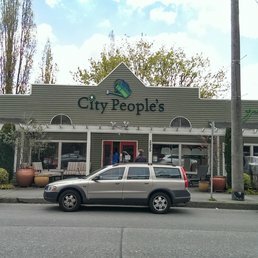 One of our neighborhood focal points was an all-women collective, City People’s Mercantile. I received a mailer from them one fall day, which featured their latest sale. I saw a drawing of a black beret. It was only $7. I went right in and got one. And unless I was at my day job, I wore it all the time. I’d morphed from being a full-time musician, to being an office administrator — what a major change! 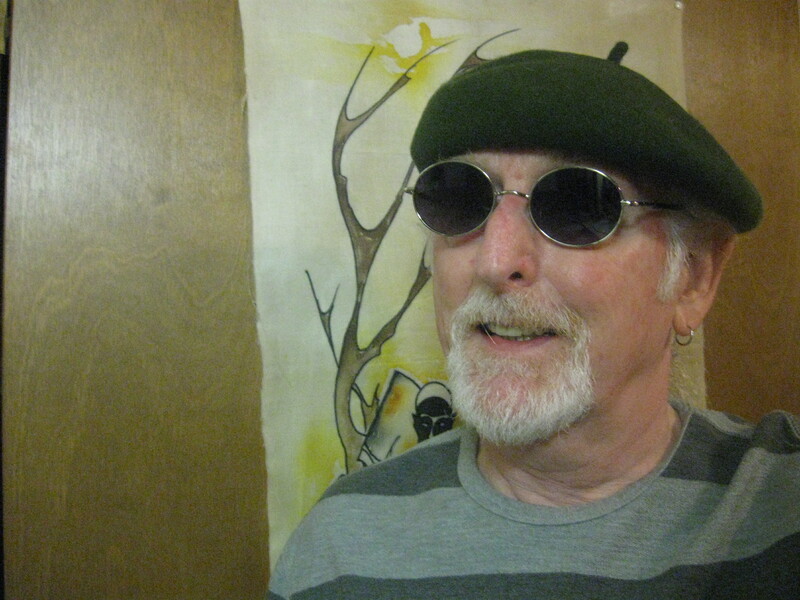 When I put the beret on, I felt like the musician/singer/creative person I really was. I wore it every night to my favorite tavern, the “Five-O-Dive-O”, which was frequented by a local scooter club led by a cool young man named Milo. Ironically or not, the tav was located right across from where I bought the beret. — We drank Guinness and Bass ale, and listened to all manner of great, new music – new wavish, punkish music. One of my favorite bands on the house playlist was New York City’s The Washington Squares. They were sort of a punk version of Peter, Paul, and Mary. And they wore black berets and striped tops. I liked to wear my beret, sing along, and drink amazing, near-psychedelic ale. Ms. Sally Jo Davis, on vacay in Cheyenne, WY. With me in the background. 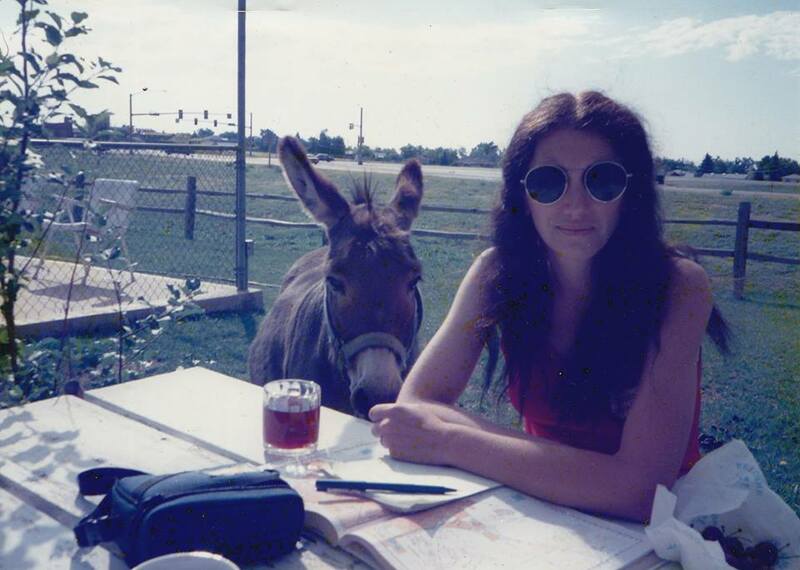 In 1987, I married my now late, folksinger wife, Sally Jo (BTW: I met her at the Five-O-Dive-O). She hated my beret, and told me to “lose it”. Well, for her, I did that. I wasn’t going to fight over it. She let me wear other hats, occasionally, but never a beret. This lasted until we divorced in 2000. I then went a whole ten years before remembering that I used to sport a black beret. 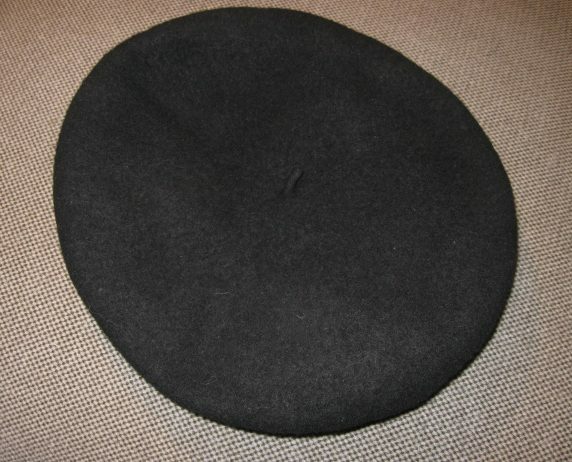 So, determined to do something about that, I hopped on my bicycle, pedaled down the street to an Army/Navy-type store, and bought my current, beautiful, black beret. Sunset at Kerry Park, 8/15/16. It was nice of the sky to match my top. I wear my beret whenever I leave my apartment. It reminds me of my boho 1980’s self, and of all the good times I had back then. When I play folk music gigs, the beret is perched on my noggin. It’s on my head when I go for long, long walks all over my town, taking copious amounts of photographs, which I then share via this blog, or on Facebook. — Recently, the Seattle Symphony projected five of my scenic photos on a huge screen, while the orchestra played a Phillip Glass piece, “The Light”, to a full house at our Benaroya Hall. I received tickets to the concert. Of course I went, and my beret came with me. 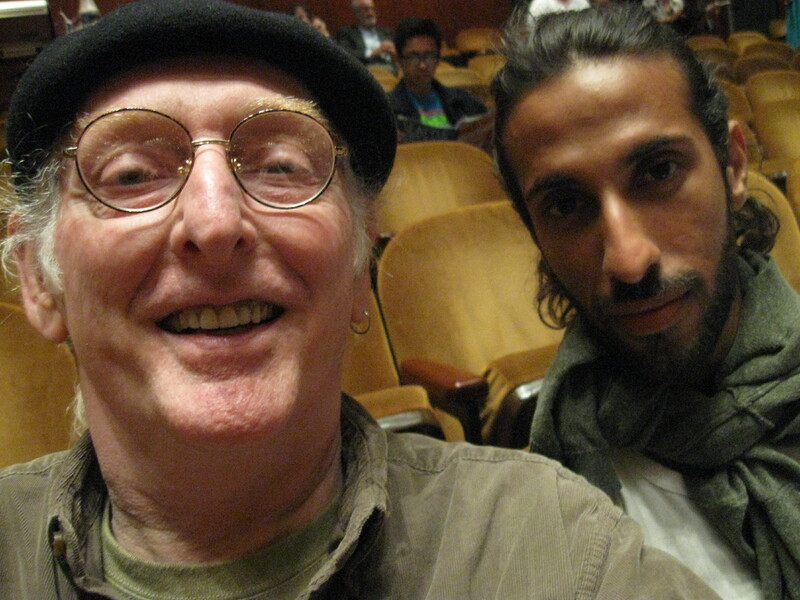 At Benaroya Hall, with my English friend, Jay, who was trekking across America. The goatee was gone; but it’s back. Folks come up to me all the time and ask me what I do; or they just guess: photographer, artist, playwright, musician. I say, “Well, you pretty much nailed it”. My beret (as well as my goatee) symbolizes much to me; mainly that its wearer is involved in the arts, he’s an independent guy who goes his own way, who has his own sense of style, who finds beauty in the world to share with all who are interested. I think I look rather zoned out here; but I’m not, honest! About a year ago, I bought a beautiful forest green beret at the same Army/Navy store, so I’d have a back-up, and for the sake of variety. However, I don’t like the way they look when new. A new one just doesn’t have the “broken-in look” that I prefer. So it doesn’t get any use. FYI, its label says : Philadelphia Rapid Transit/Ultrabasque/100% Wool/Made In Czech Republic/RN No. 58584. My black beret had the same label (it fell off), excepting the model number. Now, my story takes a strange twist: Like a lot of folks, I Google my name periodically. Because one never knows when he/she is going to learn something interesting about him/herself. 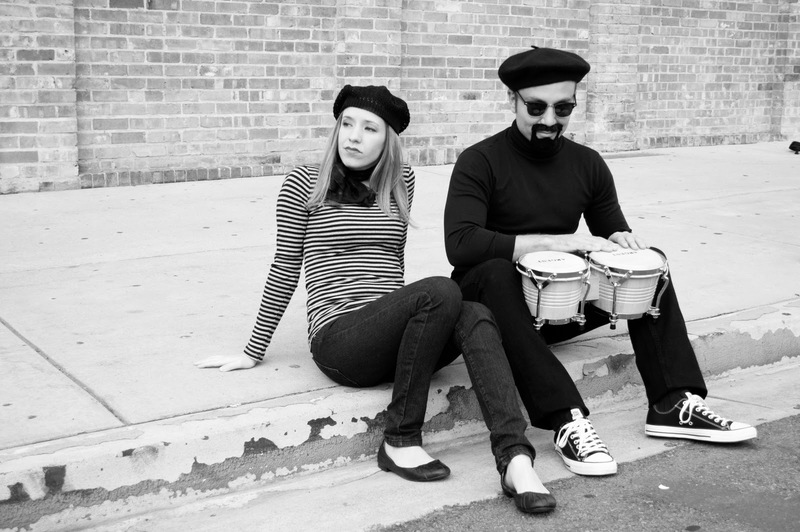 Well, I found a link to a blog site called The Beret Project, a blog all about berets, and the people who wear them. And guess what? I had a whole page! There were two photos of me wearing my beret; and there was even one of my music videos. There was a very brief bio about my music career. – Nothing about my blogging or photography. I was pretty shocked. And maybe a little creeped out at first. I didn’t realize that I was famous enough to where I’m in the public domain! Gosh, the next time I play on the street for tips, I’m gonna demand that people tip heavily! Anyway, I wrote the blogger, a good-hearted dude named Daan Kolthoff, who lives all the way across the Pacific Ocean, in New Zealand. I sent him the bones of this story, so he could flesh out my page. 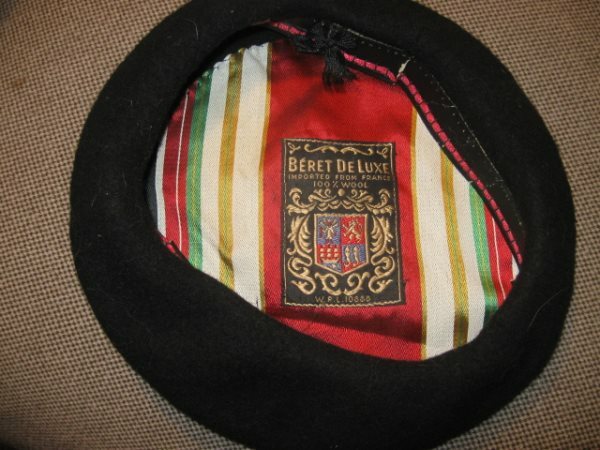 After all, if I’m gonna have a page in a blog site about famous beret fanciers, I want it to be a good one! Stan Ruehlow’s beret, lined and labeled. 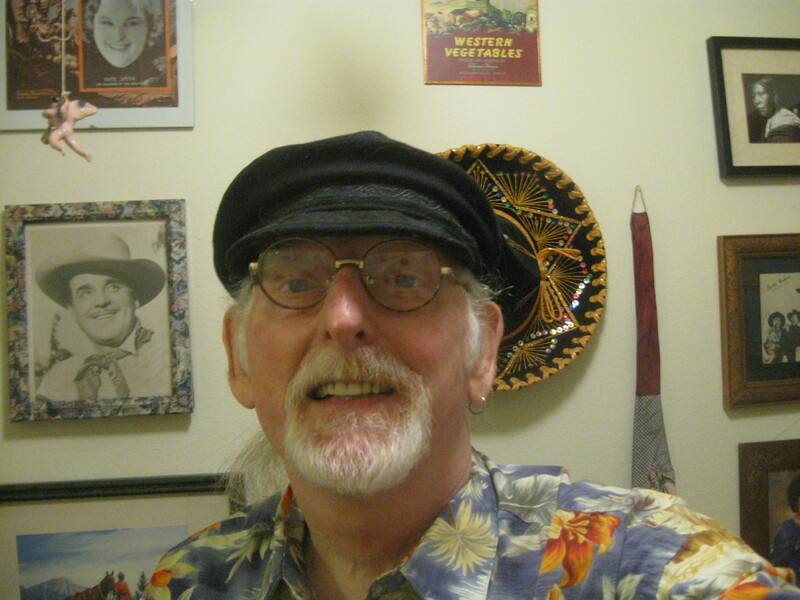 2/12/2018 update: my great friend, drummer Stan Ruehlow, sent me his fantastic French beret, which he purchased in 1965, in Walla Walla, Washington. Stan was touring with his great band from Yakima, WA, the Fluorescents (the second rock band I ever heard live). I will cherish it. And! Backing up a bit, in 1990, the Washington Squares’ lead guitarist guested on the folk music album my late wife and I released here in Seattle, “Walk With A Light Foot”. (I’ve blogged about this.) It was nominated for a Folk Album of the Year award in 1991, by the Northwest Area Music Awards. Bruce Paskow was one of three very talented guests we used on the project. He passed away just a few years later, from a sudden brain infection. I also wear the beret in his honor. If you’ve ever been to Seattle’s Fremont district, you may have seen the famous Fremont Rocket. The building which features the rocket, formerly housed a quirky curio/second-hand store called Ah Nuts. The proprietor, Josh Logan, welcomed all kinds of folks into his store, both known and unknown. Lots of people used to tell stories of seeing Eddie Vetter in Au Nuts, going through all the weird stuff. Well, Josh had a Greek fisherman’s cap which he always sported. If you saw a Greek fisherman’s cap going down the street in Fremont, Josh was probably under it. Sadly, Ah Nuts had to close, because Josh couldn’t get his lease renewed. I last saw Josh selling odds and ends at the Fremont Sunday Market, rather than in his great shop. And, I spied his cap, sitting on a stack of books. It had a price tag on it. Well, something told me to buy it. He was only asking five bucks. I handed him the money; he handed me the cap. A month or so later, I saw his obituary in the Seattle PI. Josh died rather young. He was fifty, at most. The obit didn’t list a cause of death. Knowing Josh, he probably died of a broken heart from having to close Ah Nuts. Every once in a while, I let my beret have a rest. Instead, I don Josh’s cap, and I walk around his beloved Seattle. I thought of two songs I could put here, for your listening pleasure. There was one clear winner. I imagine this is a tribute band, because Prince and his estate do NOT let any of his work stay posted on YouTube. I’ve also written about my vintage cowboy tie, and my rad winter scarf, and a story or two on hippie fashion. If you are fashion-oriented, please go to my home page and look for those stories.